New Times Music Awards goes off! Fans fill Downtown Brew during the first ever Newties! IS IT TICKING? 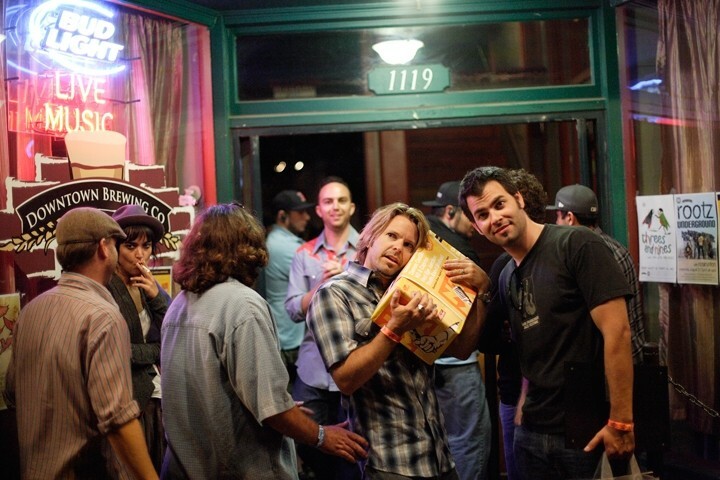 : Brad Daane of Truth About Seafood listens to his prize box at the New Times Music Awards as fellow band mate Sean Flanegan (right) looks on. About 300 people squeezed into Downtown Brew last Saturday for the New Times Music Awards (NTMA), a competition that culled from 288 entries to pick SLO County’s Best Band, Best Solo Artist, and Best Song (see info box for complete results). Our panel of five judges also chose 20 tracks for the NTMA Top Twenty CD, which every concertgoer received with their paid admission (remaining CDs are for sale at the New Times office, 1010 Marsh St., for $5 each). DOUBLE WINNER! 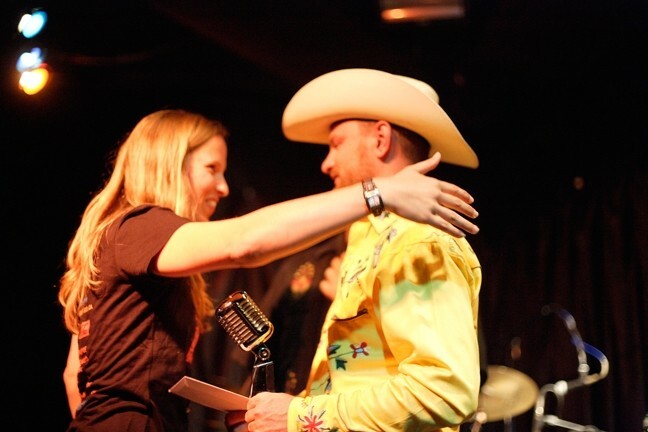 : Downtown Brew’s Korie Newman (left), who acted as the NTMA emcee, embraces Red Eye Junction frontman Reid Cain, whose band won Best Song and got 2nd Best Band. Readers got to vote from these 20 tracks for their favorite, and we received more than 6,300 votes! 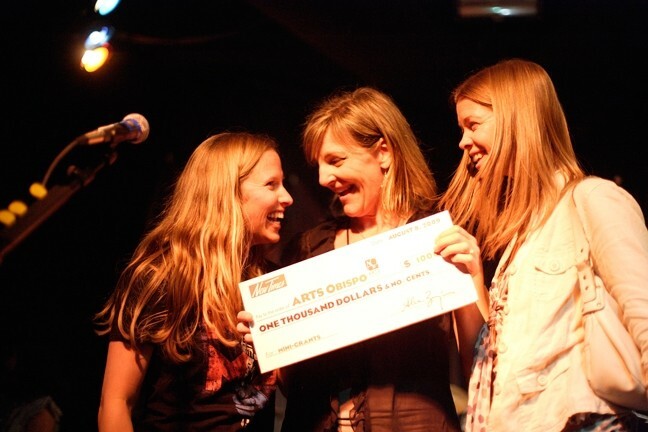 ALL SMILES : (Left to right) Downtown Brew’s Korie Newman, Arts Obispo’s Programs Manager Alissa Maddren, and AmeriCorp volunteer coordinator at Arts Obispo Jamie Dietze hold a check for $1,000. AWESOME AXES : Ernie Ball donated a guitar and bass to go along with the Newties and prize boxes for the bands. THE CROWD LOVES ‘EM! 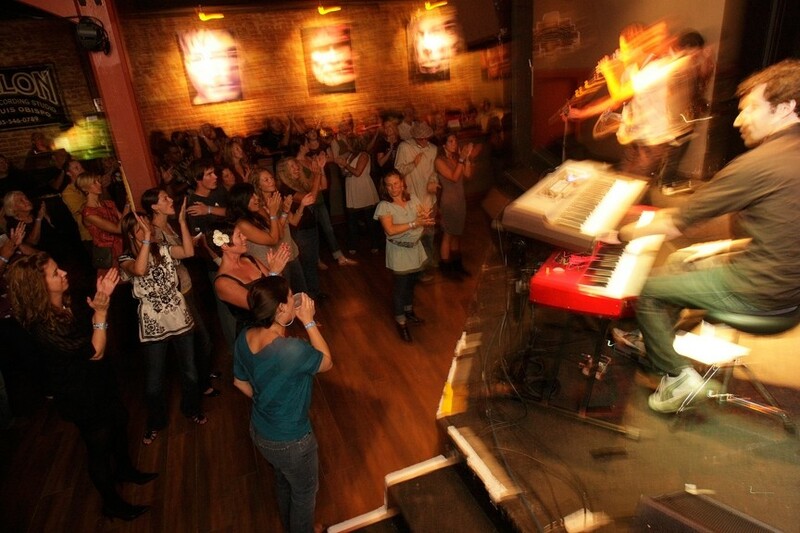 : About 300 fans packed into Downtown Brew last Saturday to see the Damon Castillo Band take top honors as Best Band. New Times thanks everyone who entered the contest, the 20 artists who appear on the CD, the artists who played the event, our sponsors: Ernie Ball Music Man, Downtown Brew, West Beach ’09: Music and Art Festival, and Dolphin Shirt Company. Most of all, New Times thanks the readers; in particular those of you who attended the contest and raised $1,000 for Arts Obispo’s Mini-Grants program. It was a magic night, and Truth About Seafood, KO & Capriss, Red Eye Junction, Chase McBride, and Damon Castillo put on a helluva show! Here’s to looking forward to next year’s awards. Cheers!